The Cavapoo dog, sometimes known as a Cavoodle is not a pure bred dog. It is a cross breed of a Cavalier King Charles Spaniel and a Miniature or Toy Poodle. They are renowned for being friendly, sociable and family pets. He first appeared in Australia in the late 1990’s. Popularity has soared and it hasn’t taken long for them to cross the water into the States and the UK. Anyone who has owned this adorable mix knows how gentle and loving these little guys can be. They make brilliant family pets, their gentle nature suits children of all ages. Checking all the boxes of a perfect family pet, these guys are gentle and placid. They will curl up on the sofa, but equally go running in the woods. Their intelligence makes them highly trainable; a general good all rounder. So are you tempted by these happy natured pooches? Let’s see where they came from, what it takes to look after them and what owners, or potential owners should look out for when it comes to their health. Free Giveaway: Instantly download our free Cavapoo eBook now. This eBook gives you the ultimate care guide, breed characteristics and a grooming guide. 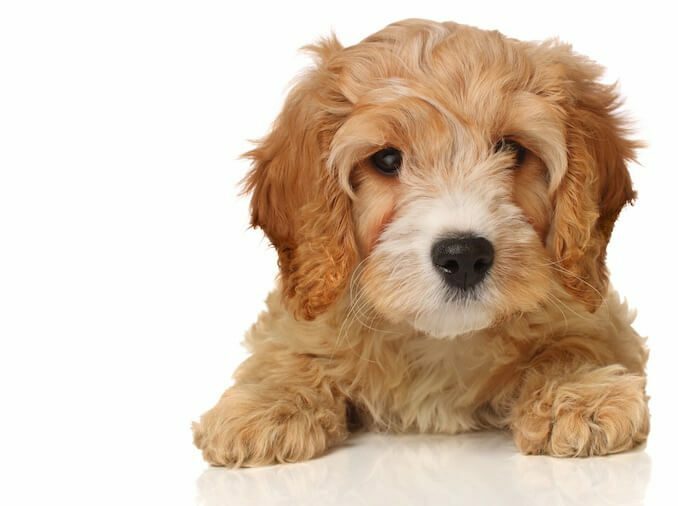 The Cavapoo was bred to be a family or companion dog; boasting a relatively low shedding coat – much more suitable for those with allergies. These guys first appeared in Australia in the late 1990’s and have since become one of the most popular breeds in Australia. 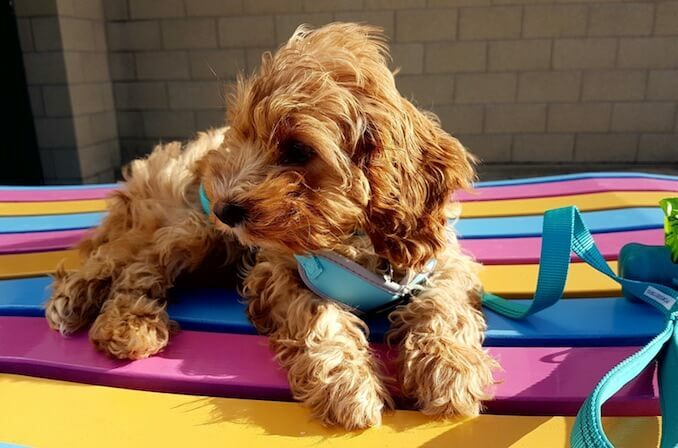 There are many Australian celebrities who boast a Cavapoo member of the family, including Julia Gillard, the Former Prime Minister and also Dr. Lisa Chimes, also known as the Bondi Vet! Of course, it doesn’t take long for popular breeds to make their way around the world. They are becoming more and more popular in the States and UK alike. A Cavapoo puppy is born once a Cavalier King Charles Spaniel and Poodle mate. For a puppy you can expect to pay anything between $1,200 and $1,800. Litter size varies from anywhere between 2-8 puppies. 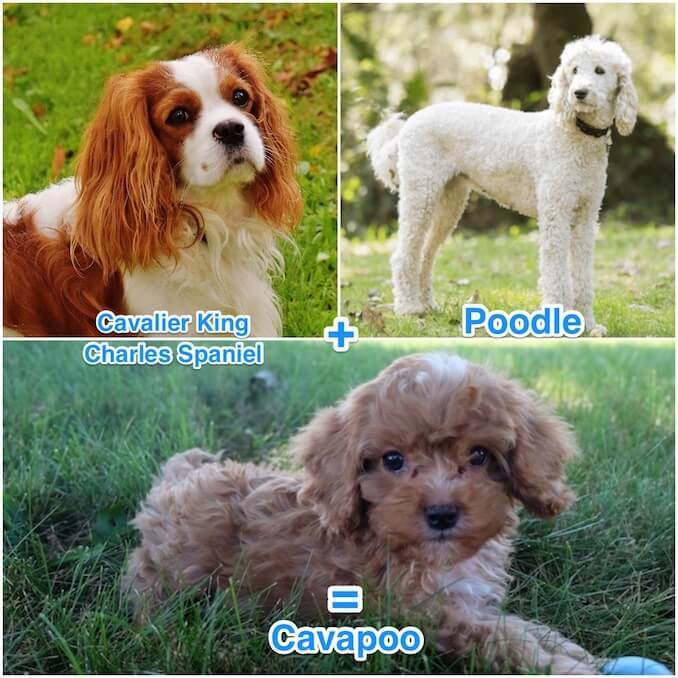 For us to understand a little bit more about this crossbreed, we’ll have a quick look at it’s parents; the Cavalier King Charles Spaniel and The Poodle! These adorable balls of fluff come in a range of colors including gold, black, white, Blenheim and even tricolored. With it being a hybrid, it’s not always clear whether you will end up with a wavy or curly coat. One thing is for sure, these small bears will melt your heart. The Cavalier Spaniel originated in the Roman Times. They were perfect lap dogs and feet warmers. 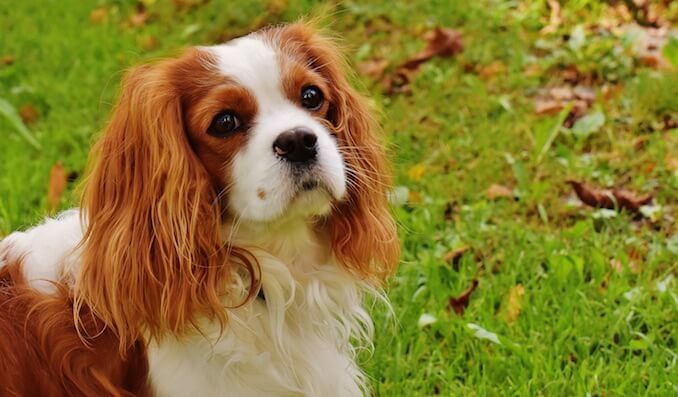 King Charles II took a strong interest in these gentle, loving pooches in the 1700’s and from then on, they were known as the Cavalier King Charles Spaniel. They are playful and energetic, but wholeheartedly loyal and loving! As they are so placid, they are perfect for all! Being super people orientated they don’t tolerate being left alone. If you happen to make this mistake, expect loud barking and destruction! For a small dog, they can be incredibly energetic and will happily walk for hours. They just love to be with you. For a spaniel, they can be quite greedy and most owners report difficulty managing their Cavvy’s weight. This also doesn’t help when we consider the health issues associated with obesity and those they are more predisposed to such as; hip dysplasia and mitral valve disease (i.e. heart issues). We also know that the Cavvy’s have a range of other health problems including: luxating patella, syringomyelia and a range of eye and ear problems. Not surprisingly we see these issues coming through in the Cavapoo so we’ll consider these in more detail later in the article. So we’ve met the one parent – let’s have a look at the other one, the Poodle. 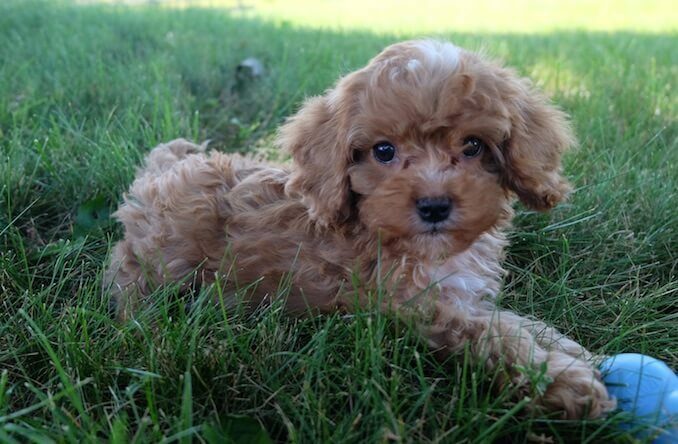 A Cavapoo must be parented by either a toy or miniature poodle as opposed to a standard. This is due to the small size of the Cavalier King Charles Spaniel that it would be mated with. Poodles are generally loved for their high levels of intelligence and their tight curly coat which is usually better tolerated by allergy sufferers. They rank a fairly high 7 out of 194 for popularity with the American Kennel Club. A toy poodle will grow to around 11” in height and between 4 to 6lbs in weight. A miniature poodle will grow to between 10-15” in height and between 10 to 15lbs in weight. Poodles are energetic little guys and love their walks. Due to their levels of intelligence they also thrive on brain games; you will never have a dull moment with a Poodle. These pooches are also extremely people orientated, so don’t tolerate being left alone. These guys will bark and cry excessively if left and also chew. A strong, consistent routine with plenty of stimulation is essential for these intelligent dogs. We also know that the poodles can suffer with a range of health problems including: hip dysplasia, eye issues, epilepsy, sebaceous adenitis and von Willebrand’s disease. Cavvy’s are playful with bags full of energy whilst being wholeheartedly loyal. Neither breed is known for tolerating being left alone and will cry excessively. Poodles have a intelligence level and are usually better tolerated by allergy sufferers. Both these guys have many known health issues which may be inherited by your puppy. In a perfect world, your pooch will have the intelligence and hypoallergenic coat from a Poodle whilst keeping the energy, loyalty and playfulness of the Cava. So let’s have a look what has been produced with the cross-breeding of these two pooches. 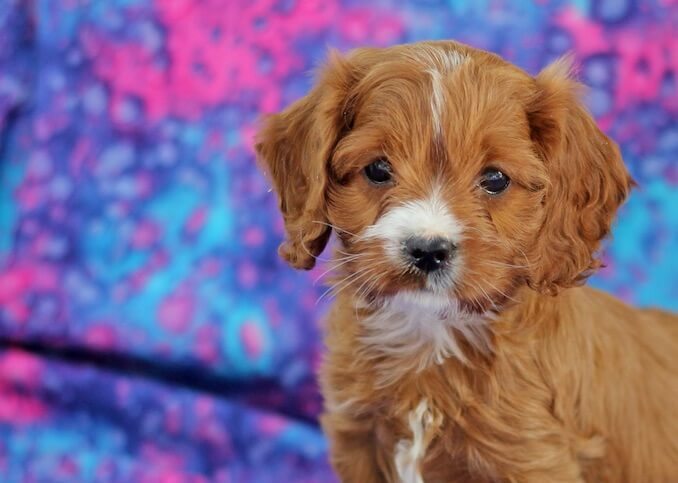 The Cavapoo is a dependable addition to any family helping them build stronger bonds. They will be gentle and loving with those babies, yet energetic and interesting with those teenagers. They have kept that spirited happiness of the poodle! The fuzzy faced teddy bears won’t make an enemy of anyone; always wanting to please. The adaptability of these pooches means they suit most home environments. As long as they have their daily walk in the park, they will cope in an apartment. Equally, they will gladly chase those squirrels off the fences around that farm. Due to their sociable nature, they won’t tolerate being left alone for long periods of time. These guys are known for suffering separation anxiety. Barking, howling, crying, chewing and pacing are all signs to watch out for. They are generally tolerant of all children, but it must be remembered that all living creatures have their limits, so owners should be mindful to always supervise dogs and children to avoid any potential disasters. Most Cavapoos are sociable with other dogs and are happy to cohabit with other animals; this does also depend on the early socialization of pup. We’ll look at this in more detail later in the article. So you’re still tempted by this adorable ball of fluff? Let’s see what it takes to care of this dog on a daily basis. Once matured, you should expect to feed your dog between 300 and 600 calories. Although these guys can range from 7-18 lbs in weight, they would still be defined as a small breed. Generally, small breeds can utilize 40 calories per pound of body weight per day. You should be aiming to feed your pooch between 300 and 600 calories per day (see table below). The dog food market is a minefield, with the options of kibble, canned, dehydrated and raw. Do your research, speak with other owners and breeders to see what they are feeding and what they recommend. Speak with your veterinarian. Manufacturers will include their own feeding guide which will indicate the correct amounts to feed your dog on a daily basis. Consider whether the food you are feeding your pooch meets his daily nutrient guidelines. For example, mature dogs should be fed at least 1 gram per pound of body weight. Ensure your pooch is maintaining an appropriate weight for his breed. Use a grow chart or you should be able to see a waistline, feel his ribs and he should have an hourglass figure from a birds eye view. Thanks to the issues of obesity in their parent Cavalier King Charles Spaniel, some Cavapoos can be predisposed to weight gain. Speak with your veterinarian if you have concerns over your dog’s weight. 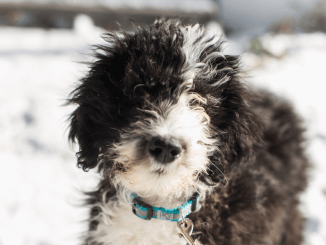 They will grow to anywhere between 9-14” in height and depending on whether it was crossed with a toy or miniature poodle, they can weigh anywhere between 7-18 lbs. He will be a gentle and mellow dog; but, thanks to his poodle parent, he still loves to run through the woods! He is happy with anything between 30-60 minutes of daily exercise before collapsing on the sofa to watch TV. They really are an adaptable, laid back dog and will fit in with your lifestyle. Their high intelligence means they excel at brain games when they’re not out walking or playing in the yard. Just be careful not to use too many food based games with their predisposition to over eating – unless of course you split their daily meals into game rewards. The Cavapoo is highly trainable – the whole family can get involved. These guys thrive with positive, reward based training. We know that using verbal reinforcement, e.g. “who’s a good girl?” and reward, results in a more responsive and stable dog. Several studies have highlighted the impact of using negative reinforcement and punishment when training dogs; specifically resulting in aggressive behaviors resulting from fear and anxiety. In order to have well-rounded, stable dog, early socialization is vital. This means introducing them to everything the world has to offer, in a safe environment. Your pup needs to meet different people; children and adults. They need to meet animals; domestic and farm. They also need to experience all those noisy machines, appliances and equipment around them. As they grow, they are less likely to respond out of fear because they have already met them, and survived. Your Cavapoo will require daily grooming if you allow his coat to grow. This is to avoid knots and tangles. He can also be clipped by a groomer every 8-10 weeks to keep a nice, tidy short coat. As they are a crossbreed you can never be entirely sure on the coat that your pup will end up with. Generally, they will have either a curly or wavy coat which will grow quite long if you let it. These guys will require regular brushing to prevent knots and tangles forming, especially in their arm pits and where their harness/collar sits. 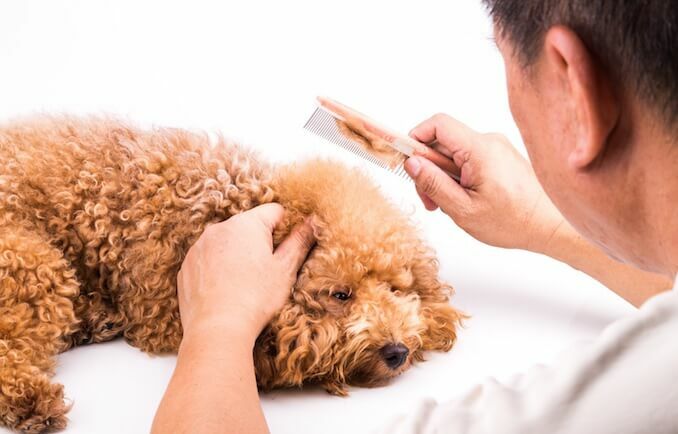 Most owners visit a grooming salon every 8-10 weeks to have their pooch professionally groomed and clipped. As they are a hybrid, there isn’t a standard grooming style for these pooches, but most owners have a teddy bear clip. Keeping their body and legs relatively short, with a round face. Most owners tend to keep the Cavalier King Charles Spaniel style ears; long and straight. Perfect for soaking up food and water. 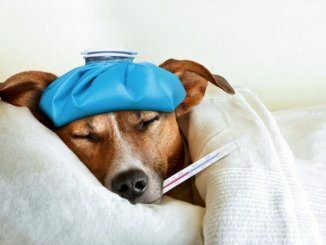 You should regularly check your pooches ears, especially with their Cavvy parent being prone to ear infections. Wipe their eyes with a clean, damp cloth and these guys will require frequent teeth cleaning. If you start grooming from a young age, you shouldn’t have any issues carrying out these essential health checks. Fleece coats are the most common coat type. They have a very loose wave or curl to them and are very soft and smooth to touch. 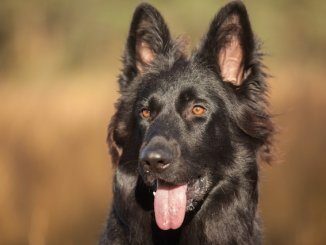 These are low shedding coats and can be clipped regularly for low maintenance. Hair coats present as quite rough and wiry – almost terrier looking. Dogs with a hair coat will shed more than the other coat types, but require less grooming overall as the coat doesn’t grow as long. Wool coats are also low shedding, and due to the tight curls, they don’t release as much pet dander as other coat types. These are much better suited to those with allergies. These coats will grow so require either daily brushing or frequent clipping to maintain. You will find there are two sizes – depending on whether the first poodle parent was a toy or miniature poodle. The parents of this cross-breed suffered a range of health issues including; hip dysplasia, sebaceous adenitis, von Willebrand’s disease and mitral valve disease. Luxating patella – this is when the kneecap moves out of it’s normal location. This is a common problem in small breeds due to their congenitally shallower trochlear groove. Heart Defects – Mitral Valve Disease is common due to the prevalence of this condition in the Cavalier King Charles Spaniel ancestry. Eye Conditions – again progressive retinal atrophy is an inherited condition. It does eventually lead to blindness. Hip dysplasia – this is when there is improper growth or development in the hip joint. The weak joint becomes arthritic and unstable and can become severely debilitating. Do your research with breeders and establish what health checks have been carried out on the parents; specifically hip scoring in the poodles and and heart and eye tests in Cavalier King Charles Spaniel. The king of crossbreeds boasting the intelligence of its poodle parent and the loving, gentle nature of its Cavalier King Charles Spaniel parent. This fuzzy faced teddy bear will fit in with most families; dependable enough to be around a baby yet energetic enough to play ball in the yard with the teenager. He will happily walk for up to 60 minutes a day then come and crash out on the sofa. He is highly trainable, responding well to positive reinforcement and rewards. Early socialization will ensure you have a well-rounded pup. This adaptable, friendly pooch will have everyone eating out of the palm of his paw. Have you previously owned this pooch? What was your experience? Please feel free to comment using the form below. We have a 1 year old Cavapoo and he is the friendliest, sweetest, most adorable dog I’ve ever met. Lovely with strangers, other dogs, young kids, etc. He does need ~30 mins – 1 hour of running around outside daily, though. Lots of energy. 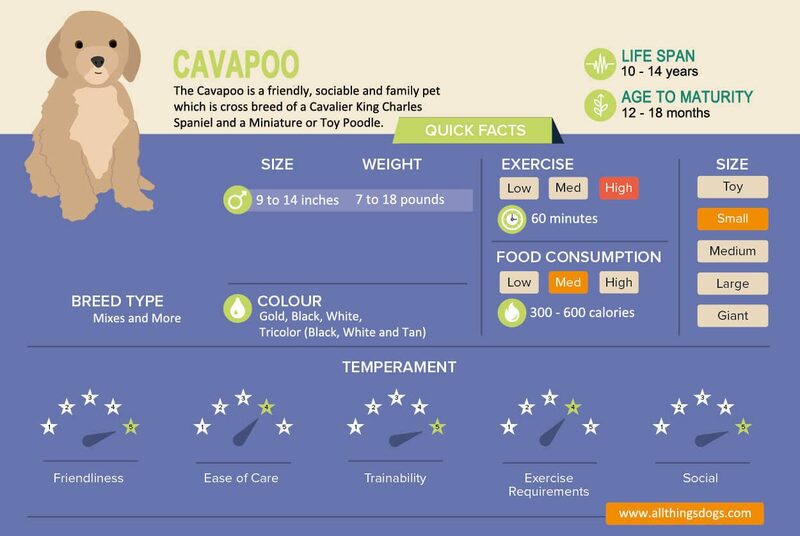 Where did you purchase your cavapoo? I live in the Chicago area. Is there any place around me? We have a Cavoodle, he is the best natured, fun, intelligent, unconditionally loving loyal dog ever. I have a Cavapoo. She is super friendly and loads of fun. Her goofy personality makes everyone smile. She is very intelligent. She learns tricks quickly. This is an awesome breed. I bought a 8 week old cavapoo, after just over a week I can safely say he was almost house trained. He is now 14 weeks and has learned to fetch, sit, lay and stay. During weekday he stays home alone for 6 hours, provided the TV is on (cartoon channel). I monitor his activity via a remote camera on my phone. Cavapoo’s are just so lovable you never have enough with them around.